Aloo Tikki: Aloo tikki is a North Indian and Pakistani snack made of mashed potato patties mixed with coriander, Onion and spices and deep-fried in oil. “Aloo” means potato, and the word “tikki” means a small cutlet or croquette. It is found in almost every chaat shop or stall in Delhi as well as in other parts of India. It is served hot along with saunth, tamarind and coriander-mint sauce, and sometimes yogurt or chick peas. Boil potatoes in pressure cooker or in a pan until soft. Boil peas in boiling water for 5 minutes. Drain water and transfer them to a large bowl. Add in the mashed potatoes, half of the breadcrumbs, corn flour, grated ginger, coriander leaves, finely chopped green chilli, garam masala powder, red chilli powder, dry mango powder, sugar and salt. Mix them to prepare smooth dough like mixture. Divide the mixture into 12 equal portions and roll them into small size balls. Take one ball and gently press it between your palms and make a round shaped 1/2-inch thick patty. Take rest of the breadcrumbs in a plate. Coat prepared patty with breadcrumbs on all sides by rolling it in breadcrumbs filled plate. Prepare all the patties from the mixture portions and roll them in the breadcrumbs. Heat the oil for shallow frying in a deep pan, on medium heat. Put 3-4 patties, at a time, over oil and cook until bottom surface turn golden brown. Flip each patty and cook until second side also turns golden brown. Transfer prepared fried patties to a plate. Aloo tikki is ready to be served. 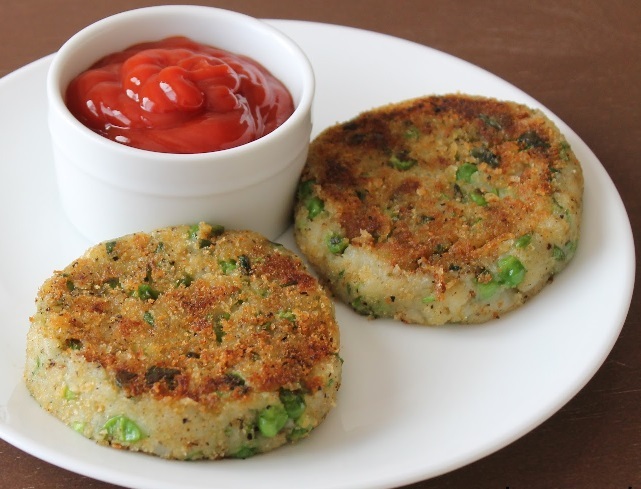 Serve crispy aloo tikki with tomato ketchup or green chutney. If you have any queries regarding the Aloo Tikki recipe, please leave a comment.